Let’s face it…most basements are dark by nature! For most of us our basement is starved of natural light from a lack windows and doors that just aren’t present. So a finished basement space needs to be artificially lit with plenty of light fixtures. But what fixtures work best in the basements? What light fixtures will create the “best bang for the buck”? Which light fixtures do the best job of “evenly” lighting our new subterranean living spaces? Well without a doubt, the 6″ recessed light fixture is our winner here! More 6″ recessed lights are installed in basement ceilings than all other light fixture types combined. In the short video below I discuss with you how to calculate the number of recessed lights you will need for your projects finished spaces. 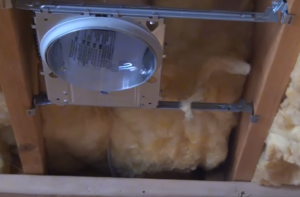 We also discuss mounting techniques for these canister style lights for several different types of ceiling framing situations. You can also check out this video for a quick overview of how to wire your 6″ recessed lights.